The iconic pink bow. ©Fondation Pierre Bergé-Yves Saint Laurent. Photo by Gilles Tapie. For months, Denver has been festooned with the image of a “Paris rose” satin bow from an evening dress in Yves Saint Laurent: The Retrospective at the Denver Art Museum (the exhibit ends today). Colorado’s capital was the exclusive US venue for this extravaganza, which made for the unexpected troika of “Paris. Madrid. Denver.” on the promotional materials. It was thrilling, even if briefly, to entertain Denver as a peer of those two cities; near the last minute I decided to attend. While I’m not a fashionista by any measure, nor did I follow YSL’s career, I do appreciate imaginative finery, the chance to enter the world of another creative soul and, on a blistering summer day, to pretend I’m in Europe. Even with timed ticketing, the exhibit entrance was packed, forcing visitors to inch along like a gigantic caterpillar through a darkened maze, the lights dimmed to protect the fabric. After wriggling through the crowds, I emerged in a brighter corridor flanked by mannequins wearing pantsuits and basic skirts and tops from the 1960s and 1970s. At the time, these were revolutionary for their comfort and simplicity. While sociologically interesting, I was eager to see his more whimsical creations. And that’s when I happened upon a short documentary running in a small theater. “What’s your best trait?” the off camera interviewer asked Yves Saint Laurent as I ducked inside to grab a seat. “La sensibilité,” he said. The subtitle read: Sensitivity. I nodded as I slid onto a cushioned bench against the back wall. The black and white footage made the designer’s chiseled cheek look like a granite slab. “La timidité.” Shyness. His mouth twitched a bit. I hadn’t realized we had so much in common. I nearly cried. By the accounts of his lifelong companion, YSL was painfully unhappy, unable to shake deep depression, despite the solace of cigarettes and success. It seems as if he might have found temporary relief and possibly some joy in color. This, too, I understood; some of my most exuberantly colorful art emerged from moments of despair. As I strolled the rest of the exhibit and ogled some of his more stunning pieces, such as a beaded jacket inspired by Van Gogh’s sunflowers and whimsical cocktail dresses, I couldn’t help but think that along with inspiration and talent, suffering and darkness had also been midwives to these glorious outfits. After traversing a hallway of floor-to-ceiling fabric swatches and brilliant gowns that led to a room filled with dozens of his tuxedo variations, I saw the dress with the signature pink bow, the final gown in the show. In the context of the other couture, including two capes (bright orange and red) embroidered with dozens of bougainvillea and other gasp-worthy items, it was rather tame and looked smaller and less vibrant than it did in print. As I exited the gallery I pondered why, of all the images the museum could have used to market the exhibit, they chose that one. True, it was easy to “read”. 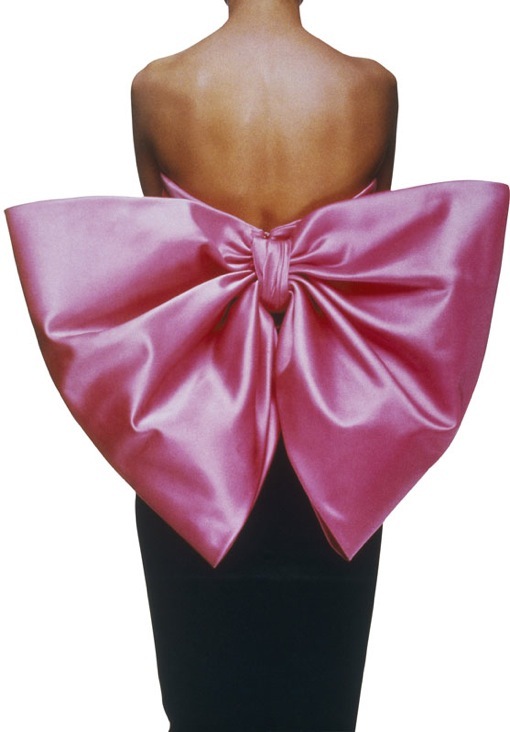 The pink satin and the model’s silhouette are soft, pretty, and uncomplicated, unlikely to confuse or offend; the outsized bow innocent yet eye catching. It was an understandable but uninspired choice. In France, promotion included an image of Yves Saint Laurent posing unclothed (this and other photos were displayed here, too, but perhaps Denver’s museums aren’t yet peers to Parisian ones when it comes to edginess – nudité or otherwise – in marketing). A few days later, I saw “Pink Ribbons, Inc“., a documentary about the corporatization and consumerization of breast cancer awareness. And I wondered if America’s ribbon saturated and “bepinked” culture contributed, even if subliminally, to the selection of a familiar rosy motif as the face of the exhibit to help acquaint people with what might have been a foreign name (indeed, the museum posted a pronunciation video on its website). “Pink Ribbons, Inc.”, among other things, exposes businesses whose products contain suspected carcinogens and sponsor upbeat breast cancer awareness campaigns. This practice is known as “pinkwashing.” Others call it the darkness behind those cheery looped ribbons. « Declaring Independence: Would You? Love your reference to the caterpillar, because that bow sure looks like a butterfly. I love the feel of your writing. Thanks for reading and commenting. Funny, I hadn’t seen the butterfly until you pointed it out! I love how others see connections that might elude the creator.